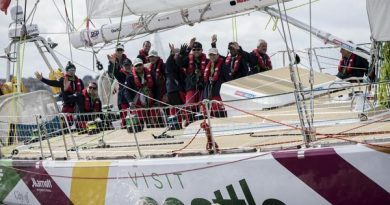 Qingdao continues to lead the fleet today, followed by Great Britain in second and Sanya Serenity Coast in third as the teams push towards the Scoring Gate. Not much further back behind the leading pack are HotelPlanner.com, Liverpool 2018 and Unicef in fourth, fifth and sixth respectively and Visit Seattle, which has taken a more westerly route, is in seventh. The teams are heading into a more tropical, cloudy and moist region now. Unicef Skipper Bob Beggs explains that this means a temporary suspension to the champagne sailing conditions, explaining: “Getting closer to the Inter Tropical Convergence Zone (ITCZ), otherwise known as the Doldrums, means more convection as the ocean is much warmer. This creates more cloud cells, rain and fluky winds to keep the helmsmen, spinnaker trimmers and cockpit team on their toes trying to keep the spinnakers aloft and not wrapped around the forestays. Greenings, in twelfth position, is starting to catch up with the fleet despite sailing across a 40m long rubber pipe floating in the ocean in the last 24 hours. Replacement Skipper Dan Smith said: “A wise man once told me that hardship makes you stronger, we have certainly had our fair share. Our crew dug deep to get the yacht back up to speed and we have since been going well in breezy conditions under our mediumweight spinnaker.